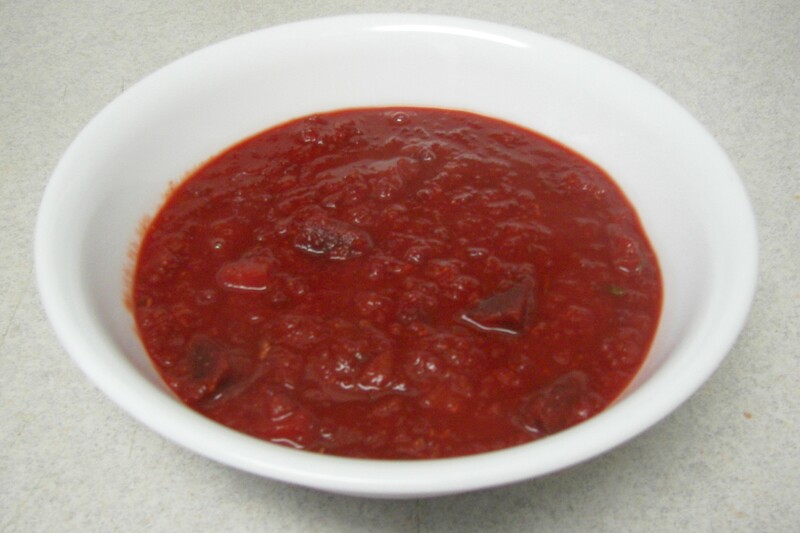 This is one of my favorite soups. I first made this recipe in my Whole Foods Production class during grad school at Bastyr University. I have made it many, many times since. Chop carrots and beets. Heat oil in large soup pot, add onion and sauté until soft. Add carrots and beets, sauté a few minutes. Finely chop the fresh herbs and wash the lentils. Add herbs, lentils, bay leaves and water/stock to pot. Bring to boil. Lower heat and simmer about 40 minutes. Remove the bay leaves, puree the soup in batches. Dissolve the miso in ½ cup water and add to the soup. Yum. This is one of the best GF cornbread recipes I have found. This recipe is from Karina’s Kitchen, a great site for GF recipes! Lightly oil a 10-inch iron skillet or 8 x 8 baking pan. Combine the dry ingredients in a bowl and whisk. In a large mixing bowl, whisk eggs with the butter, oil and water and beat for one minute. Add in the dry ingredients and beat by hand just until a smooth batter is formed, about one minute. Heat the prepared skillet over medium-high heat. Pour the batter into skillet or baking pan. Bake the cornbread in the center of a pre-heated oven for 25 to 35 minutes, and slightly golden around the edges. A wooden pick inserted into the center should emerge dry. Place on a wire rack and allow the cornbread to rest 15 minutes before cutting. This helps keep the slices from crumbling apart. This is one of my favorite dishes ( I do have many favorites). Simple, easy, and yummy. Place it all in the slow cooker, cook on high for 8 hours. Season with black pepper. Sometimes I will add onions, garlic, and maybe some diced carrots and celery. Pre-heat oven to 425F. Mix the dry ingredients in a medium sized mixing bowl. Mix the wet ingredients in another bowl (whisking the egg), combine the two and mix until smooth. Pour batter into 8 or 9 inch baking dish or into muffin tins. Bake until browned on top and toothpick inserted in the middle comes out clean. I served this with some simple sautéed cabbage. I love cabbage. I love beans. We eat beans at least 3 times a week for dinner I would guess. We had a super yummy bean soup on Sunday. Smoky-Hot Pinto Beans, from the always wonderful Vegetarian Cooking for Everyone by Debra Madison. You have to buy this cookbook. So far every single recipe has been really good. Simple, good food. Drain the beans, put them in a soup pot, cover with 6 cups fresh water, and boil for 10 minutes. Remove any foam that collects, then add the chipotle and epazote. Lower the heat to a simmer. While the beans are cooking, heat the oil in a medium skillet over medium heat and cook the onion, garlic, oregano, cumin, and hot paprika for 4-5 minutes. Add this mixture to the beans. 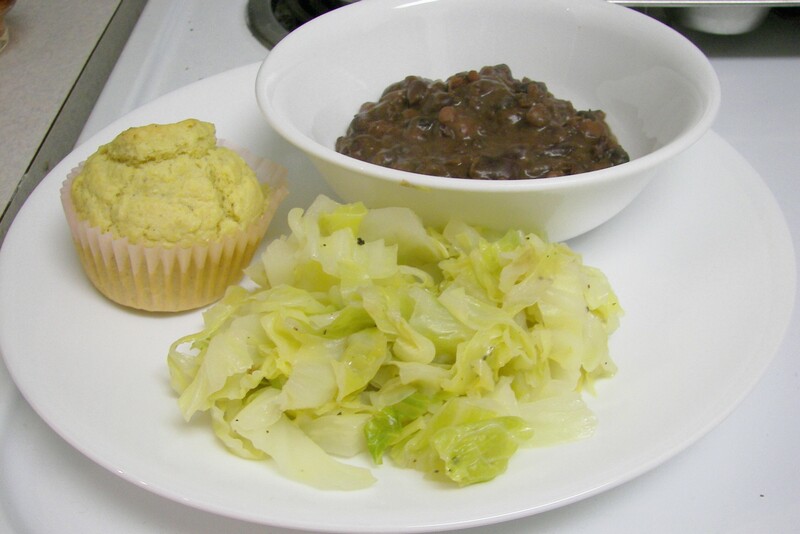 Continue to cook the beans partially covered until they are tender, about an hour. Add 1 tsp salt about halfway through. Slightly altered from Vegetarian Cooking for Everyone. I served this with gluten-free cornbread (I’m on an elimination diet), heirloom tomatoes and some garlicky kale and chard. 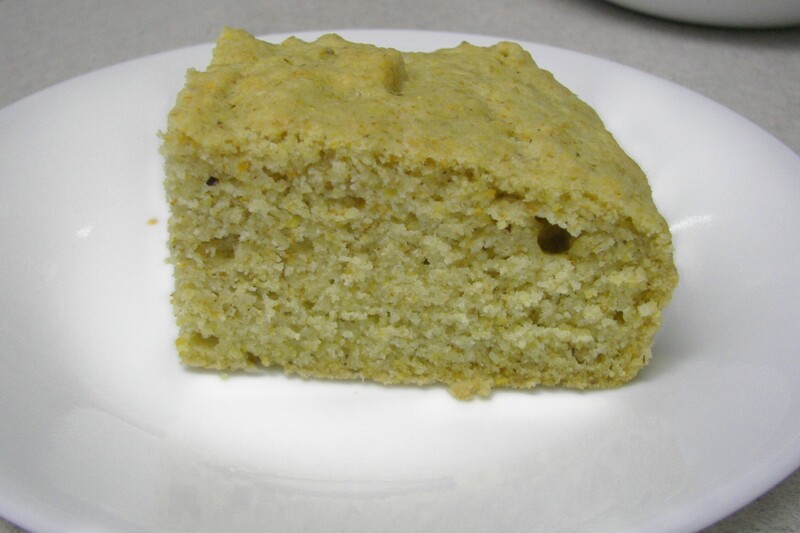 The gluten-free cornbread was from a mix by Bob’s Red Mill and it was really good.